A mother-of-four benefits cheat lied her way to £8,000 that she was not entitled to after lying about her living situation, a court has heard. Married in August 2015, the pair became Kerry and Leanne Hope-Lambert, and Leanne had been in a comfortable position to support the family financially, Burnley magistrates were told. The defendant, of Oxford Road, Nelson, admitted two counts of benefit fraud - dishonestly failing to promptly notify the Department for Work and Pensions of a change in circumstances between June 17, 2014 and September 17, 2015; and dishonestly failing to promptly notify Pendle Borough Council of a change in circumstances between June 23, 2014 and September 13, 2015, at Nelson. 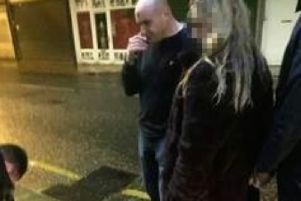 Kerry Hope-Lambert, who has a conviction for criminal damage from three years ago, was planning to take up Saturday night bar work, but will now not be able to after receiving a two month curfew between 7pm and 7am, seven days a week. Due to her means, the bench made no order for costs, but she must pay an £85 victim surcharge out of her benefits. The chairwoman said the defendant had no relevant convictions and the justices felt a medium community penalty was the correct one. Prosecutor Mrs Philippa White told the hearing the total amount overpaid to Kerry Hope-Lambert was £8,065.01, having claimed income support from 2007 and it was paid to her on the basis she was a lone parent living alone with four children and had no other form of income. Mrs White continued : "Payments were paid on the basis she was to report any changes in her circumstances. Both paid these benefits on the basis of the proviso that a change in her circumstances should be notified. It became apparent she failed to declare she was maintaining a common household. "She also agreed she had told the Department for Work and Pensions her partner didn't move into the house until September 2015. However, evidence was put to her regarding bank accounts which demonstrated financial links between the couple before the date of their marriage." The prosecutor said other evidence also linked the pair to the same address. She told the court : "It was at this point that Miss Hope-Lambert admitted her partner had been living at her home and they had been maintaining a common household from June 2014." Her partner had relinquished her previous tenancy around that time. Mrs White continued : "She agreed the claim had been dishonest and that she had failed to report a change in circumstances for financial reasons. It wasn't a fraud from the outset. She had a valid claim until the period of her partner moving in. She has nothing of a similar nature on her record. The defendant has only one previous conviction, for criminal damage three years ago." Kerry Hope-Lambert, who was not represented by a solicitor and wiped away tears during the proceedings, told the bench she didn't want to say anything about the offences.